Here is an interesting question asked by Vivek at Betting Adda website. In the interest of general public I’ve reposted this question here in order to demystify this question which always pops up in any new trader. This is the most obvious question which every new trader at Betfair will ask to himself at some point of time. It’s good that you asked me. Normally new traders are shy to ask such question to avoid being declared noob. The reason why you asked this question is very obvious. You have heard and read it over and over again that Betfair is an exchange and not fixed odds bookie where the odds are decided by punters themselves rather than being fixed and you expected odds to be much better. This leads to obvious question – why odds at Betfair are just slightly better than odds at any fixed odds bookie site such as William Hill? The answer is very simple but before I reveal the answer let’s go back to square one and start it over again. Ask yourself, what are odds? Odds reflect the possibility of occurrence of event. If an event is sure to happen (100% possibility) then, theoretically, odds for such an event will be 0. Practically it’s 1.01 at BF (this is the smallest odds possible at BF) or 1.00001 or similar ridiculous number at fixed odds bookie site. On the other end of spectrum if an event is impossible to happen then odds for such an event will be infinite (theoretically). At BF odds for such event is 1000 (max possible odds at BF). Sometimes bookies just close the book when event reaches either side of the possibility. Once we have relearned the odds lets bring the question again. Why are odds at BF not much better than those at fixed odds bookies? Because you can’t set odds for an event to be ridiculously bigger or smaller than what they should really be. Odds are, more or less, reflection of the chances of an event occurring. So if whole world knows what the chances are for an event to occur then why would someone set odds much bigger or smaller than what their true value. Let’s take a live example for tomorrow’s T20 match between SA v WI. 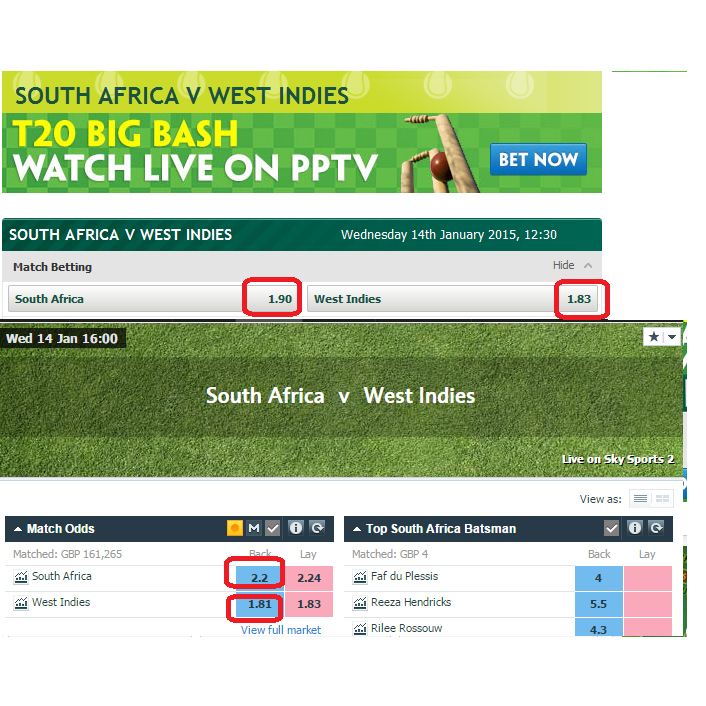 Paddy Power are offering 1.90 for SA and 1.83 for WI. Which is what everyone else would think after doing all data crunching, analysis and going through stats etc. I, personally, feel that WI should have been between 1.80 and 1.70 and SA should be above 2.00. Odds at Betfair are 2.2 and 1.81 for SA and WI respectively. Holy cow! I didn’t see these odds at BF before I predicted my odds above. So you see the odds are BF are true reflections of the possible outcome of a match which is the average of all odds being offered by traders. Fixed odds bookie offer slight less to get their cut on both sides of result. If thousands of traders, including myself, think odds for WI should be around 1.80 (WI chances for winning this match is 55%) then why would odds be a lot more than this? Imagine someone offering 2.50 for WI. Everyone’s reaction would be that there is something fishy going out there as it’s not the true reflection of the expected match result. Such high odds are possible if someone gets some inside information that WI might lose the match in which case bookies will lure punters to back WI as such high odds will salivate any punter. Another possibility is that bookies themselves might be involved in odds fixing. Sometimes they also set an odds which is not quite practical. Odds offered by UK bookies for England during FIFA world cup were quite lower than what they should have been. It’s no-brainer. Everyone in England backs English team and bookies know it hence they exploit this situation. They set odds to be much smaller to void potential loss should England wins by some miracle. England could go on winning few matches but at the end they are going to get kicked out handing hefty profit to bookies. I just wanted to add that if you are looking for a massive odds difference between Betfair and other bookie sites then you should wait for some unexpected to happen. If I take example of the same T20 match then this unexpected event could be if Gayle gets out at “Golden Duck”. This will throw Betfair exchange off it’s feet and odds will move without any sane rule. If you are lucky you might get 10-20 points movement during the time he slams his bat in the dugout. Fixed odds bookies will control the odds and do you know what they do? They close the market whereas on Betfair Cricket market never closes during in-play (live betting). If you are quick and have faster broadband connection then you can move in quickly on Betfair exchange to eat money during this madness. Market will stabilize within 1-3 minutes after such madness and odds at Betfair will come closer to odds at fixed odds bookie sites. Thanks a ton Bhai, as always you explained it in a very simple way for anyone’s understanding. Why the Inplay section odds also move in sync with fixed odds site? Also to the comment by Callum i don’t know how many are able to catch those overshot odds which you can see on the graph. Bhai does someone gets to that extreme odds, which i see in every event 4-5 times of the highest possible odds gathered or its an imaginary line and why Betfair shows it on the graph.is it like for once at least that exchange of odds does happen? Odds have to be in sync as every aspect of an event is pre-calibrated. There are special software which can predict any unpredictable movement and odds associated with that. Before I explain further you must know that the only difference between an exchange and fixed odd bookies is the role of bookkeeper. On exchange the person on the other side of the bet (lay) becomes bookie. On fixed odds bookie site the bookie himself is sitting on the other side (lay). The difference between odds on exchange and fixed odds bookie is due to the fact that fixed odds bookie gets his cut from the odds itself and hence his odds are always lower than actual odds. If you add back the cut fixed odds should become at par with exchange odds. Exchange don’t earn money from the odds but they take commission out of your earnings. Odds fluctuation at betfair are real, if you use software then you can see them in slowmo as they happen. Download BetTrader software and see odds for Horse racing towards the end. Odds fluctuate from around 2 to 1000 and then again come back to 10. You might be having butterflies in your stomach thinking if we match our odds at both extremes we become instant rich. Such fluctuations are not a norm but they do happen only if you could predict when and this, my friend, is the whole trading business – predicting the fluctuations and be prepared for it. There are software which try to squeeze money out of such fluctuations and there are trader who live on such extreme fluctuations. If you use the software you can see money laying towards the bottom of odds (1.01) on both side (back and lay). This is home work for you. Find out why so much money is dumped towards the lowest end of spectrum and how trader are making profit from it. Odds movements are very fast so you might not always get it matched at the desired odds. Sometimes they get matched sometimes they don’t. Here is little secret. Lay odds at exchange will never be lower than the fixed odds no matter what. Even during fluctuation there might be an opening to exploit this out of sync odds but that’s lasts only in few seconds and bookies have protection for that too. Whatever you see on the graph is true and actual fluctuations, they are not imaginary. Odds value of 1000 is for real. Once I manage to match that and hedged at 500. It was winning horse but I didn’t want to take risk as stake on back bet was £1000. I wish someone could write a bot which takes out humans out of trading. We would just sit and watch our growing bank balance as event unfolds. You also see such fluctuations in footie when a goal is scored only to be ruled out after few seconds. Mate! your information are mind blowing. Where do you get them from? I was always wondering how this bloody exchanges work and couldn’t figure out completely let alone mastering the art of making money out of it. Keep it coming, I’m reading.